Here is an article written by my colleague, Todd Houston who is a professor at my alma mater, The University of Akron that you won't want to just skim over. Todd's writing was voted one of the Most Popular 2012 ASHAsphere Posts published by the American Speech, Language and Hearing Association. Dr. K. Todd Houston, Ph.D., CCC-SLP Cert AVT, wrote about the trend of parents choosing spoken language options, such as Auditory-Verbal Therapy, for their children with hearing loss“. HERE is a link to view all the most popular posts from ASHAsphere for 2012. HERE is the link for Todd Houston's article that I have reposted below. Approximately 95% of parents of children with hearing loss are hearing themselves (Mitchell & Karchmer, 2004), and trends indicate that many parents are choosing spoken language as the primary mode of communication for their children with hearing loss. In fact, some states such as North Carolina, are reporting that parents are choosing spoken language options for their children with hearing loss more than 85% of the time (Alberg, Wilson & Roush, 2006), especially when they know spoken language is a viable outcome for their child. And, these parents are typically selecting approaches that support listening and spoken language, such as Auditory-Verbal Therapy, without initiating visual communication systems. 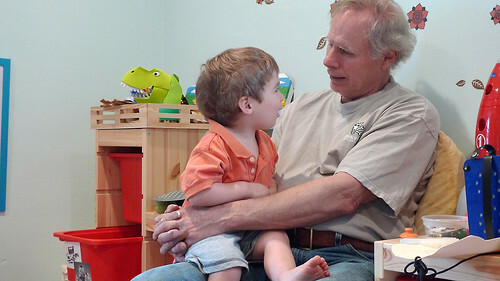 With early identification and the use of advanced hearing technology, children with even the most severe or profound hearing losses can access audition and follow an intervention approach focused on achieving typical developmental milestones in listening, speech, language, cognition, and conversational competence. Parents’ communication choices are based on their long-term desired outcomes for their child. Once those decisions are made, professionals providing early intervention and habilitative services should support the parents’ choices and provide the necessary support and intervention to ensure, to the greatest extent possible, that the child achieves those outcomes. “Auditory-Verbal Therapy facilitates optimal acquisition of spoken language through listening by newborns, infants, toddlers, and young children who are deaf or hard of hearing. Auditory-Verbal Therapy promotes early diagnosis, one-on-one therapy, and state-of-the-art audiologic management and technology. Parents and caregivers actively participate in therapy. Through guidance, coaching, and demonstration, parents become the primary facilitators of their child’s spoken language development. Ultimately, parents and caregivers gain confidence that their child can have access to a full range of academic, social, and occupational choices. Auditory-Verbal Therapy must be conducted in adherence to the Principles LSLS of Auditory-Verbal Therapy” (AG Bell Academy, 2012). Promote education in regular school with peers who have typical hearing and with appropriate services from early childhood onwards. The AG Bell Academy has designated two paths to certification for Auditory-Verbal practitioners: LSLS Certified Auditory-Verbal Therapist (LSLS Cert. AVT) and the LSLS Certified Auditory-Verbal Educator (LSLS Cert. AVEd). The LSLS certification is awarded to qualified professionals who have met rigorous academic, professional, post-graduate education and mentoring requirements, and have passed a certification exam. Typically, LSLS certified practitioners are licensed audiologists, speech-language pathologists, or educators of the deaf who have the required background, training and experience in listening and spoken language theory and practice with children with hearing loss and their families. For additional information about certification as a Listening and Spoken Language Specialist (LSLS), speech-language pathologists and audiologists should contact the AG Bell Academy at academy@agbell.org, visit the website ate www.agbellacademy.org, or call (202) 204-4700. Alberg, J., Wilson, K., & Roush, J. (2006). Statewide collaboration in the delivery of EHDI services. The Volta Review, 106, 3, 259-274. Mitchell, R.E. & Karchmer, M.A. (2004). Chasing the mythical ten percent: Parental hearing status of deaf and hard of hearing students in the United States. Sign Language Studies, 4, 2, 138-163. Dr. K. Todd Houston, Ph.D., CCC-SLP, LSLS Cert. AVT, is an Associate Professor in the School of Speech-Language Pathology and Audiology at The University of Akron. His primary areas of research include spoken language acquisition in children with hearing loss, strategies for enhancing parent engagement in the intervention process, Auditory-Verbal Therapy, and telepractice. He directs the Telepractice and eLearning Laboratory (TeLL), an initiative to evaluate clinical practices in the area of distance service delivery in Speech-Language Pathology.